Pakistan government's decision to reinstate a sacked Supreme Court chief justice has prompted the opposition to call off a major rally in the capital. Opposition leader and former PM Nawaz Sharif had joined campaigning lawyers in demanding the reinstatement of Iftikhar Chaudhry, who is resume his post in March. I hope after this, we'll implement the charter of democracy and true democracy in Pakistan. We'll make the judiciary stronger and parliament supreme. We have got the fruit of our two-year struggle. Now the destiny of this country will change. This development will lead to a revolution in Pakistan. It's victory for those who fought for independence of the judiciary and it's the first time in the history of Pakistan that a movement launched by the middle class has proved successful. This is a statesmanlike decision taken to defuse a serious confrontation, and the apparent removal of this long-standing national issue is a substantial step towards national reconciliation. Now is the time for all Pakistanis and their political representatives to work together, with the support of their friends and allies, to peacefully strengthen their democracy and ensure a positive dialogue as they move forward to deal with the many issues confronting them. The statesmanlike act by President Zardari... [hopefully] will help defuse a dangerous confrontation so that Pakistan, with the help of its many friends, can address the nation's pressing and urgent needs. The president is generally accepted as a person who believes in reconciliation and consensus. 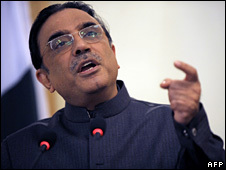 Mr Zardari has helped retrieve a situation that was going from bad to worse. Democracy is gaining strength and the way forward is very promising. Instead of weakening the government or the president or prime minister it has actually strengthened the government. We have taken the issue away from those who wanted to use mob violence and intimidation. We have taken the country out of the political crisis in an extremely mature and political way. A surrender for one was the only way out. The president has had to concede to restore the chief justice. Zardari has been weakened enormously. I am sure he is a very nervous man today. No country can progress without an independent judiciary and the government - by restoring the chief justice and other judges - has also realised it, and we think it is a big success.